A month or two ago I shared a post called 7 Ways to Enjoy Being Crafty with your Toddler. It highlighted some of the simple things I've learned as I've crafted with both my son and daughter during the toddler stage. Now that my son is in an afternoon Kinderprep almost every day, I actually have a little bit of solo time with my 21 month old daughter when she wakes up from her nap. Sometimes we play with her toys and read books and sometimes we try and do a little craft project... and sometimes we have time to do all three! 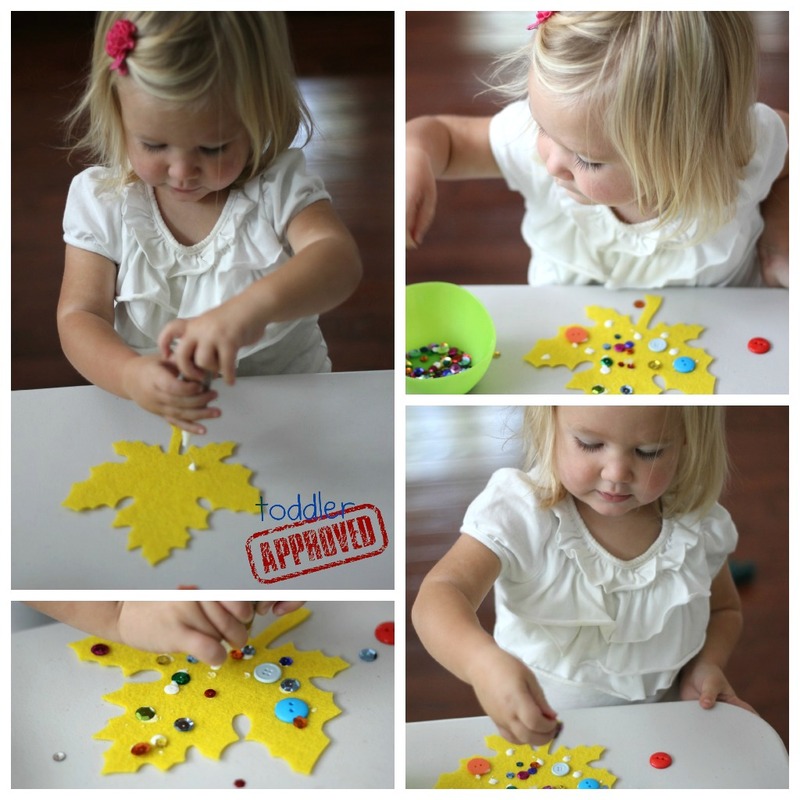 I hope to share some of the simple toddler crafts that I do with her as part of a Mom and Tot Craft Time Series. 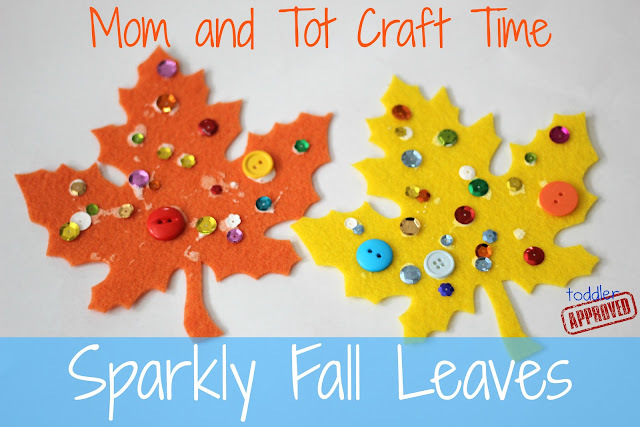 This week I am sharing a simple Fall activity where we made Sparkly Felt Leaves! Pre-cut felt into leaf shapes, sparkly objects (we used sequins and buttons), and tacky glue. 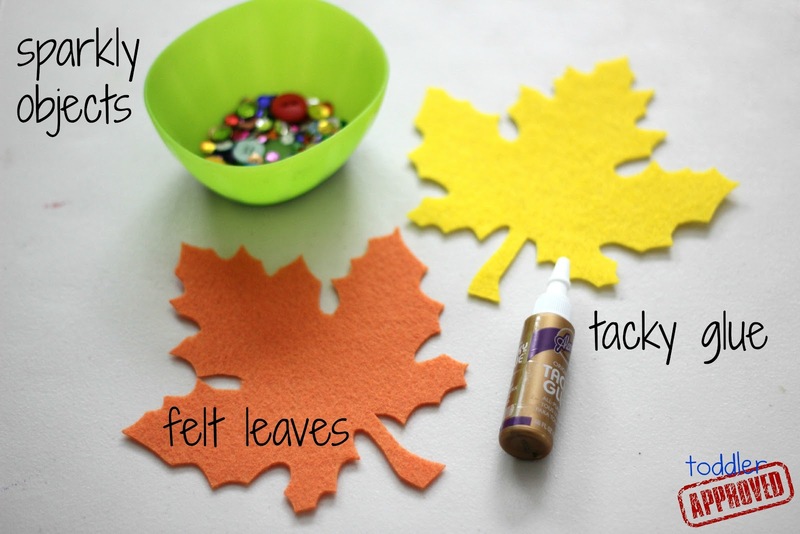 Squeeze tacky glue onto the felt leaves. Press buttons, sequins, and any other embellishments onto the leaves. String several leaves up using ribbon and hang as a decorative Fall garland around your house. Crafting along with toddlers is a great time to teach language concepts and even simple requests and sentences in a sneaky way. Whenever I sit down and craft with my toddler, I am amazed at how much longer she will explore the materials. I am also floored sometimes by the words that come out of her mouth... maybe because I am used to her brother talking so much that I miss things she says? Words and language concepts we reviewed in this activity included: on top, under, down, up, color words, adjectives like sparkly, shiny, bumpy, big, little, etc., and then following simple directions/requests. Some of the directions were ones like, "Can you find the big button?" "Can you pick up the sequins off the floor?" "Can you press down the green sequin?" This activity also worked on fine motor skills and building some finger muscles because the glue was hard to squeeze and the sequins were tough to pick up! I love collage projects with varied materials for toddlers! 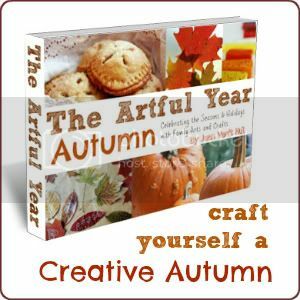 Do you have any other favorite simple Fall crafts for toddlers? Also, did you happen to catch my October BabbaBox Sneak Peek post? 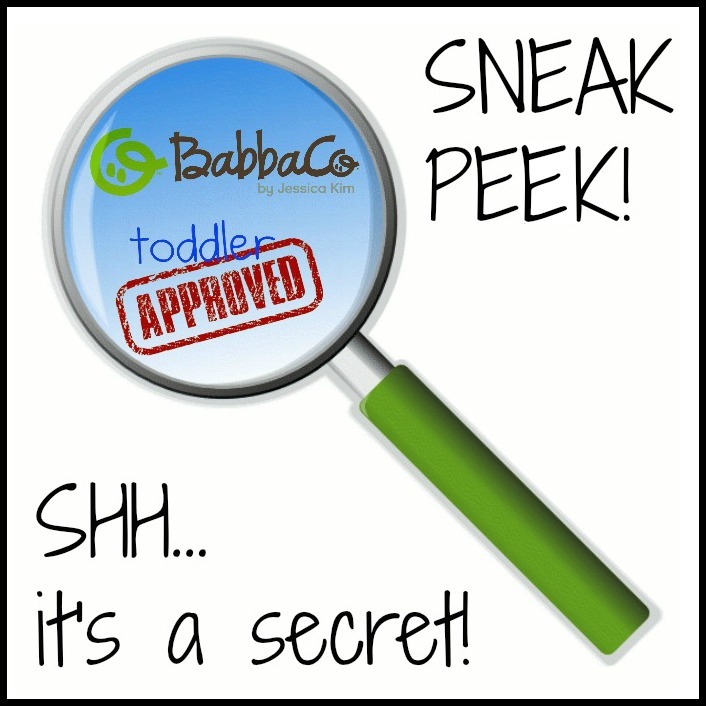 There is a special discount code that only can be used until October 1st... so hurry and order your October box so you can discover what the surprise inside is! I really like these leaves! I expect they will show up soon at my house! Thanks for the link! I love what they did with the leaves! I have a silly question. Did you buy the leaves or did you cut them yourself? If you bought them, where did you get them? Thank you. I cut them myself out of stiff felt. I've been fabric ones/fake leaves, but not felt ones. You could probably do the same activity with some of the fake leaves out there though if you don't want to cut out the felt! Thanks so much for answering. I am impressed with your cutting skills, lol. Your maple leaves are amazing. I know mine would not come out as nice as yours. I will look into the fabric leaves. Thanks again. Ha! :) The stiff felt definitely makes it easier. I have a maple leaf template I'm sharing as part of a post tomorrow that I used when I cut these out. That and good fabric scissors helped a lot! Have fun creating! Great idea! Simple but creative! And the leaves look so cute! So cute!! My girly girl would love these! Thanks so much for sharing! Popping over from NTFFC! Thanks for sharing this idea with Tuesday Tots! I've featured your post this week on In Lieu of Preschool: http://inlieuofpreschool.blogspot.com/2012/10/its-fall-at-tuesday-tots.html Stop by and grab a featured button if you'd like. I'm off to pin your post now!